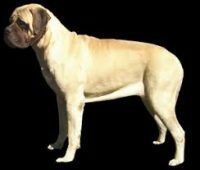 The Mastiff dog breed has been around for centuries. Long ago, they were used as war dogs. However, they are now seen more as a kind, calm, and quiet dog, great for families that can manage their great size and constant drooling. Coming in many different sub categories, one thing remains the same, they are very large dogs. The term mastiff is fittingly similar to the breed being “massive.” They are actually considered to be among the largest of dog breeds. Though many other breeds may match up in height, it is in weight that he takes the win. Often this breed will reach a weight over 200 pounds. Due to this great size, it is important to consider family needs when considering bringing this breed home. Young children or frail elderly people may be easily knocked over simply due to a small bump by the dog. When the dogs begin to grow old and need help getting around, is someone in the household capable of helping such a big dog? Despite being such a large dog, they do, in fact, have a good nature and temperament for families that are fully prepared for the responsibility. As with all breeds, this dog does need plenty of exercise. However, after they exercise they prefer to spend the majority of their time inside. As a loving family dog he wants to be around people, even considering climbing up on a lap. As with all dogs, this love and easy temperament has lead to some faults as well. His love for his family can extend as far as to offer his protection against a threat. Being such a large dog, his protection over his family can cause a problem for the person posing the threat. Or, if left alone for too long, he will begin to feel neglected and that may lead to some destructive behavior. Getting regular exercise will help prevent this, as well as proper training and socialization. Generally, the life expectancy for a mastiff is relatively short, 8-10 years, though some have lived for much longer. Although they are generally healthy dogs, they are prone to certain health conditions. As with all breeds, it is important to look into the breeder and the heath of the puppy’s parents. One of the most obvious things to consider is orthopedic concerns due to size. Hip or elbow dysplasia can be of concern, as well as issues not related to size like hypothyrodism and eye problems. This breed has also been known to be a little bit gassy. This can generally be helped by adjusting the diet but can also lead to gastric torsion, or bloat. Eating a very large meal, or consuming food or water too quickly can cause bloating. The stomach distends with air and then it can twist which prevents the dog from vomiting or belching to dispel the air. Without immediate medical attention, a dog suffering from bloat will likely die. This breed is pretty standard when it comes to size and color. Their coat consists of a short, straight outer coat and a dense undercoat. The colors are generally limited to fawn, apricot or brindle. A brindle dog will generally have a fawn or apricot colored background and dark stripes. Despite the color of the coat, the majority of these dogs have a dark muzzle, nose, ears, and eye rims. Some will have a white spot on their chest. Keeping a dog well groomed and cared for can help prevent some health concerns. With so much drool it is important to clean that wrinkly face often. Regular brushing of the hair can help manage too much loose hair due to shedding. And speaking of brushing, do not forget about those teeth. Tartar and bacteria build up quickly, and brushing can also help that bad breath that leads to gum disease. It is thought that this breed, descendant of the molosser, originated in Asia. There is reference to the breed from Egyptian, Babylonian and Greek civilizations more than 2,500 years ago. Due to their size, they were often pitted against lions and other fierce animals, used for war and even hunting. Crossbreeding of the mastiff led to the foundation for other large dogs, like the Saint Bernard and Rottweiler. Or even a smaller breed, like the pug, often considered the mini version of a mastiff.